Ech, I’m over this. There are no photos from this leg, even though Oxford will be hurt that I took so many photos of The Other Place. Not being prepared and guidebooked-up — and indeed, not feeling like being guidebooked-up — I started and ended my day with free Wi-Fi at the same café by the bus station. There was also a midday break of an hour, reporting back to my bosses on the week’s events (the stuff that couldn’t go on the public work blog). Typing takes time, dammit. The humanities virtual research environment (Extreme Closeup pics of wax tablets, plus annotationware) stunned me into silence not because of their tech per se, but because of the complexity of metadata they anticipated — which made them go with RDF. After that, I could hardly bring up the old school schemas of the ARCHER project. I may have gotten a bit carried away with my enthusiasm for the eIUS project, but I think they’ve got what they’re trying to do exactly right, both with the business analysis and their use of the e-framework — and all that basically on their own, as far as I can tell, without much in the way of handholding from the e-framework people. 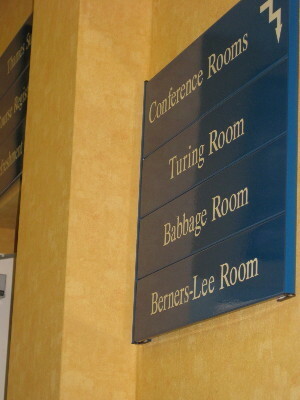 Oh, and as before, Oxford e-research is exceptionally well catered. OK. The eUIS people pledged to get me out shopping by 3:30, but I was having way too much fun with them, so we kept going to 4. I then wandered out to see what I could shop for before 5:30. 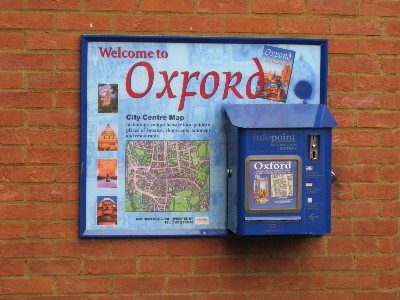 (Oxford may be a town, but a city it ain’t.) Borders was a dead loss — surprising for Oxford Town. I kept going, and ended up at the Oxford Ice Rink — which is well and truly out of the way. Any further, I’d be back in Iffley. I retraced my steps, picked up my tickets for the next day at the train station (just as well, as it turned out) — and happened across Oxbow Books: specialists in Graeco-Roman and Mediaeval books. Aha, says I, some shopping at last. I couldn’t leave Oxford without buying at least one book. Well, not as much shopping as I’d have liked, but I did manage to pick up two books. Hinge, George. 2006. Die Sprache Alkmans. Serta Graeca 24. Wiesbaden: Ludwig Reichert. Hefty oldschool philological grammar of a Doric poet. I’ve already completely lemmatised Alcman (and in fact just about everyone else before Aristotle), but there was some guesswork involved, and this may prove a useful cross-check. Or not. It’s bought now, anyway. Constantinides Hero, Angela. 1983. Letters of Gregory Akindynos. Washington D.C.: Dumbarton Oaks. These letters got mentioned briefly in my book, as one of the few instances of Byzantine dissident literature. (Ihor Ševčenko called them samizdats): the guy fell afoul of the Byzantine civil war, and wrote the letters in hiding. Well, now I can judge for myself how samizdat they are. Two more acquisitions, since I’m at it. Toufexis, Panagiotis. 2005. Das Alphabetum vulgaris linguae graecae des deutschen Humanisten Martin Crusius (1526–1607), & Ein Beitrag zur Erforschung der gesprochenen griechischen Sprache im 16. Jh. Neograeca Medii Aevi VIII. Cologne: Romiosini. Pompella, Giuseppe. 1996. Lexicon Menandreum. Hildesheim: Georg Olms. For my hoovering up of all ancient Greek words, I need to track down as many dictionaries as I can. (I mentioned a bit of that in the Cambridge Non-Grownup Classics library.) Dictionaries of specific authors don’t come up much, because the Standard Dictionaries cover most of the words; but they don’t cover all of them. Especially with an author like Menander, who’s mostly papyri found after 1950 — and with this dictionary, which came out at the same time as the latest supplement to the LSJ dictionary. (Which means that the LSJ didn’t get to incorporate the new words, like they did with the Galen dictionary I found.) Of course, Modern Greek isn’t the only discipline that libraries in Australia are retreating from: there is not a copy of the Menander dictionary to be had in any Australian library. So I ordered this online. Looking forward to it coming over: I’ve got 99.3% recognition of wordforms up to Aristotle already, and this will help my stats. You can tell I didn’t care much about Oxford sightseeing if I’m blogging about my books. At any rate, retreated to Iffley for the night, did not eat (there was Curry With Greeks the previous night to recover from), bummed around the internet (because ech, I’m over this), and STILL woke up 5 am for an 8 am departure. I hate how Engelond has made me a morning person: it’s unnatural. As I type, my train is going past cows the next morning, on the way to Brighton. For I Do Like To Be Beside the Seaside. Actually I don’t (and I had the option of staying put in London), but it seemed like a good idea when I booked the trip a month ago. But ech. Over it.